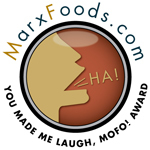 Posted by Toy Lady in Food, Home, meal plan monday, Musings. Boy oh boy, this weekend’s trip to the public market was . . . frosty! We really didn’t need much – mostly, we go because it’s our habit, and it’s good to get ourselves – and Peeps’s mom – out of the house. That, and we do want to show our support for the vendors who are also out in the cold. Without sounding whiny, I’d like to comment that this has so far been one of the coldest winters I can remember. Single digit temperatures, day after day – why, it’s ridiculous! It’s just a good thing spring is only 3 months away! 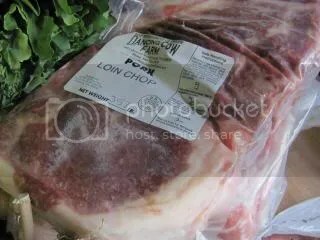 We did splurge a bit and pick up a package of pork chops this week – they’re HUGE! Two pork chops were three and a half pounds! Needless to say, one chop will be plenty for the two of us to share. Which will leave the second one to enjoy another time! The farmer said that this was the meat from their “breeding sow” – the chops are huge, and they’re much fattier than anything we’ll see in the supermarket. And I mean “fatty” in a good way here – modern pork is so lean, you may as well be eating boneless chicken breast! I remember, as a teenager, when my parents butchered our sow – it was the same thing – huge, nicely marbled, juicy chops. So . 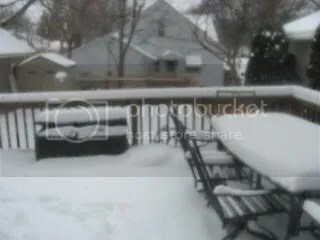 . . we’ve gotten a bit of snow. Again. I don’t really mind the snow so much, at least not as long as the sidewalk plows have been out. It’s the trudging through the unbroken snow that wears a body out, you know? Poor Jarly, though. I mean, he’s out there walking in his bare feet (and yes, I know I can get him boots for his feet, and no, I’m not going to) – if the cold is bothering him (I can tell because he won’t put all his feet down at the same time! ), we cut our walk short and come inside. Then I warm Jar up with a nice brisk toweling-off, including his cold, wet feet. With Peeps leaving for work around the same time I do in the mornings now, we’ve been able to enjoy breakfast together fairly regularly, which is nice. I’ve taken to making a double batch of oatmeal now and then – how handy is it that steel-cut oats in the rice cooker take about an hour – just long enough to walk the dog? We each have a serving, then I stash the rest in the fridge for an even quicker breakfast later in the week. 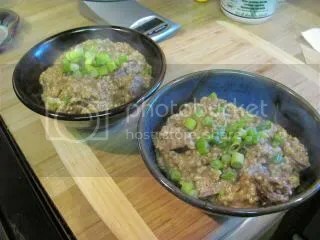 This morning, I reheated some of the leftover oatmeal with some leftover short ribs and sauce and added a sprinkling of chopped scallions. How awesome was THAT after a cold, snowy morning walk? And once again, it’s time for the weekly menu plan. We’re looking forward to another chilly week here, but, after all, it is January in the Northeast, isn’t it? It’s winter, so we enjoy winter food. Monday – I did pick up a bunch of broccoli raab at the market, which will go nicely with some pasta and the Italian sausage Peeps and I made last weekend – we love this classic dish! Tuesday – Peeps has been dying to make Tex-Mex cheese enchiladas since we received the newest issue of Cook’s Country magazine – it’s cheese and it’s Mexican and it’s Cook’s Illustrated – I’m totally on board with it! Wednesday – My parents just got back from Florida, after having celebrated their 50th anniversary. We did send them a gift, but we also wanted to take them out for dinner. Rooney’s is running an anniversary special, which kind of strikes me as serendipitous, don’t you think? 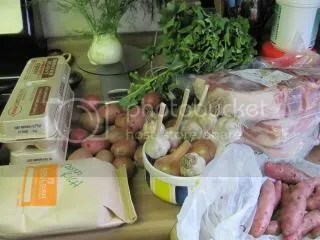 Thursday – We spent the better part of Sunday with sauce simmering on the stove – which will make it perfect for Minimal Effort Thursday! What? Pasta twice in one week? I don’t remember the last time we did that! Friday – And yay, it’s pizza night! Lest we forget about it, I’m reminding myself that there’s some prosciutto left in the fridge which, I think, will be just lovely on a pizza. In the alternative, we’ve also got some Italian sausage which will be just as yummy. 3 months away? Spring is TWO months away! Not that I’m counting or anything 🙂 I agree; this winter has way overstayed its welcome and it’s not even Feb. 😦 Poor Jarly. My heart goes out to all the critters out in this kind of cold. I’m refilling the bird feeder each day. As always, your food looks delish. Although I have never liked oatmeal; I wish I did. Stay warm! Can never go wrong with some enchiladas! That is like on our menu at least once a month! I know, right? We don’t have them nearly as often as we’d like, though. I’m certainly looking forward to it! Consider us poor folk “down south.” We are shivering in temps that would probably be positively balmy to you. Although it is supposed to get up to 36 today, which is 10 degrees or so higher than yesterday. And we are actually NORTH of where all those poor folk are stranded in the snow. My daughter’s sister-in-law spent the night in a WalMart in Birmingham, AL, where the governor has called a state of civil emergency. Go ahead. Laugh.They had two inches of snow. Oh, I know, Kay – and from what I hear, Atlanta is a mess, too! I just had this conversation with someone else – while you thin-blooded southerners turn to icicles when the temps fall below 40, you can manage to function when we up here are melting (above 80? OH the humanity! ), so I guess it’s a trade off. Though I’ll say – it’s hardly fair that you all get to close everything down when it snows – we don’t get to do that in the summer!